Give him his head. You know what it means in the horse racing world and what it means in the human world. I’m talking about a new, more literal, definition. First, to catch up, you were concerned that your horse wasn’t forward. Because you know pain is almost always the reason, you had your vet out. If you’re certain your horse is sound, but you think he’s lazy, then it might be your own backside. Are you sure? That brings us to what your horse wanted me to say in the first place. It’s your elbows. Does being my demo horse make you want to pull away. Counter-bend is very bad, so I’ll pull your ear a bit closer, like an inside rein. And now you toss your head? I’ll need to tighten my grip while pulling your ear then. With your shoulders locked in your pockets and your neck braced against me, why aren’t you forward? Enough anxiety to want to run away, why don’t you just relax? Because the more tense you get, the more I must hold tight. It’s human nature. You need to relax that poll. Maybe if I supple you with my inside rein. Soul-killing to be my demo horse? Don’t stop riding; fix your hands. And by that, I mean your elbows. Not a problem for you because you ride western? If you have rope reins and slobber straps, the weight they add to the bit means continual contact, regardless of your hands. If you ride on a slack rein, but then grab or correct, that’s not more gentle to threaten. Do you ride in a rope halter? It’s no accident those knots in the noseband are positioned over nerve bundles on your horse’s face. Is your horse’s head still because of a leverage bit? That just makes your hands even louder. Really, it’s your hands. Here is the crazy part; if you have a problem with your hands, it’s really your seat. 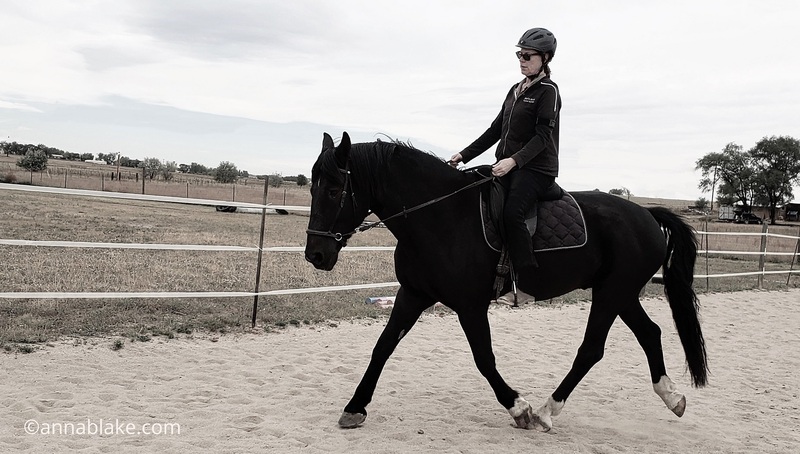 When a horse is moving freely forward, gliding in a fluid forward gait, his poll is relaxed, his head in a naturally good position, and his balance restored. Horses were designed to move, and over-controlling hands restrict the natural movement. It alters his balance back to front, tail to nose. You feel that, once you think bigger than me pinching your ear, right? You can feel your feet uncertain on the ground. Now, dear demo horse, I’ll let go of your ear. Pull your hands out of your pockets. Feel your spine gently compensate for each weight shift of a step. Feel yourself naturally breathe within the stride, as your ribs massage your lungs. Is your poll softer? Let the rhythm of the stride make you stronger, feel the glide of perpetual motion. Effortless, more ground covered with less energy. Swing your arms, body moving in balance. Autonomy, while dancing with another individual. Give him his head. Being fussy doesn’t mean he’ll run off, he needs to get air into his lungs and blood to his brain, he needs to use his poll. Literally, let him hold his own head, give him the autonomy to find his own balance. You know it’s true because when he runs in the pasture, his head position is perfect. Trying to recreate that under saddle must be done by his free movement, too. Balance can’t be gimicked with tack or hand control. It’s all in his push from his hind, and the rider staying out of the way. Start here: Warm your horse up on a neck ring. If you ride on a long rein, it’s not enough, your horse will tell you. A rein uses leverage on a weak area and a neck ring ignores the face entirely and asks the shoulder to move. Walk on, his head totally free to balance himself, warming up muscles with just one directive. One thing at a time. Just forward. Too close to the rail? Forward. Stuck in a corner or at the mounting block? Forward. Spaced-out rider? Forward and breathe. When time has passed and you are both warmed up from walking forward without restriction and reversing and arcing in both directions, pick up your reins to a length where the neck ring connects with his shoulder before the bit does in his mouth. We aren’t correcting anything right now, just feeling. Ride for five minutes with your elbows pressed to your waist. Look at his poll as you actually feel the grip of your upper arms on your side. What happens to your body? How does it impact your horse? Then use your hands to catch the slack in the reins but follow the movement of his neck. Would that mean your elbows moving back slightly? Just feel it for five minutes. No corrections; listen to your body. Watch your horse. Check in with your hands. Are your wrists kinked in some weird way? Straighten them, thumbs up. Now position your elbows slightly in front, just above the point of your pelvic bone. So, your hands would be in front of your saddle. This time watch your horse’s poll and allow your hands to float forward with his poll. Almost as if your hands could push his neck to be longer. Five minutes, please. Check in with your hands. Do they feel ignored? Perfect. Did you notice that the movement in his neck is a different rhythm than his footfalls? Were there moments in the stride when the reins slacked and tightened? That’s what your horse doesn’t like about your elbows. Were there moments when he reached farther with his stride because your elbows extended in a way that encouraged him forward? Contact should feel like a long rein to the horse. Contact must follow the natural movement in his spine, encouraging him forward, requiring our contact to be elastic and giving. But hands are not elastic, your horse will be the first to tell you. Rather than raising your horse’s anxiety, use your own self-awareness to understand his needs. Light elastic contact starts in your elbows. Our 2019 clinic schedule is filling. Email ambfarm@gmail.com for hosting details or to be added to the email list. Such a beautiful picture of this pair! Isn’t it? Norman’s confidence is blossoming and Nickole gets the credit. Yay! Thanks for reading along, Missy. Hear, hear! It IS the elbows! That much ignored, all important joint in our arms that too many riders lock in an open position. Too many focus on hand position, to the detriment of their elbows, and ultimately the horse. Here’s hoping you’ve started a new trend in position and awareness! Hear, hear, I agree. Thanks, Lia. Thank you! I know I often look like I’m trying to fly out of the saddle with my elbows flapping out there, so clearly I needed this reminder. A work in progress still. Aren’t we all a work in progress? Thanks, Celeste. So informative as usual Anna. It inspired many thoughts and questions. One central question that I have is, do you recommend starting a green horse with just a neck ring before introducing bridle and/or bit? I have a pair of feral, very green newbies. Laurie, I can’t guess. I don’t know the horses and I don’t know your riding experience or if you’ve started other horses. Sorry, just can’t give advice when I know so little. Good luck and go slow. Oh Anna! This careful & detailed description is SO helpful! Thank you a million times! Good post full of good ideas and the ‘demo horse’ concept is so telling. Thanks Anna. Teehee. Thanks, Anne. Looks like you’re having a wonderful “winter”. Fabulous lesson! I’m printing it and going to give it to people who might enjoy it. Expect more readers for your blog! Thank you, again, Anna! I always find that a quick read of one of your posts turns into a research (and learning) session. So much to digest, and then try to avoid overthinking while riding! Thank You! Thank you for this wonderful comment… glad that you were inspired to dig and cogitate, Judy. Brilliant Anna, – I was tensing up just reading it until I got to your bit about relaxing and breathing my whole body shook and relaxed!! Teehee, glad I put that part in then! Thanks, Mary. Sublime! You put it so well. Thanks Anna. “Give him his head.” Such a simple concept, and yet, I know that I have thought similar words while riding, and have said similar words to riders I have given lessons to, and yet I think I often got it all wrong. It was not true giving, it was a kind of fake giving, still putting him in a “frame” of my own choosing. Usually while I stopped breathing, too. I love the photo, he looks to be in control of his own neck and his own balance, from ears to tail. He has not fallen apart into two (or more) pieces, which is something I think I see quite often. And see in photos of my own riding! Sorry, all previous horses I’ve ridden! Thanks, Moa. This photo does just make a heart soar… too often we kind of ride the brakes and it drives horses crazy. Love the article. Great way to illustrate what is happening when we ride and manage the horse. Can you give more information about the neck ring. What type to get, size, and anything else I might need to get started using it. If you use the search bar, I’ve written about them in past blogs, too. I have a couple of videos in the online Barn group, but I can give you a hint. Light rope with a square knot, at a length that allows you to hold it to their neck as you hold your hands shoulder’s width apart, about 3″-4″ above the withers. Hope that helps, thanks for asking, Joyce.